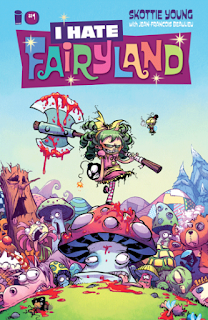 The Fellowship was fortunate enough to obtain a copy of I HATE FAIRYLAND #1 from Image Comics. Skottie Young writes and draws, and Jean-Francois Beaulieu colors. Gert is a six-year-old girl and, as six-year-olds often do, she wished she could journey to a magical place. She got her wish, but it wasn’t quite what she hoped it would be. The journey home should have been a quick and easy quest, but 27 years later she’s still working on it. Physically she’s still six, but on the inside, well, not so much. And her adventure is just beginning. Don’t be fooled by the sweet, pretty cover, people. Except for the bloody battleaxe part – that’s the part you should judge this book by. But it’s great twisted fun, that’s for sure. 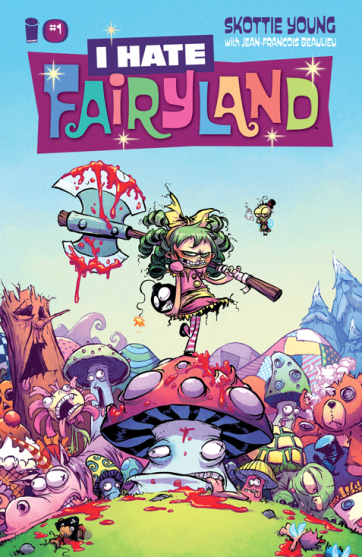 I HATE FAIRYLAND #1 is available now at your FLCS or at imagecomics.com.